Here's another installment of my favorites...! running song: The Veronicas - "Untouched" -- I first heard this song during a spinning class that was taking place in my gym. It really gets me pumped if you can get past the first few verses! 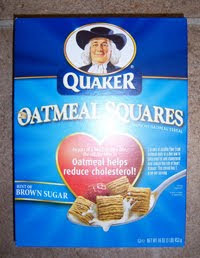 cereal: Quaker Oatmeal Squares -- It has a nice touch of brown sugar! A 3/4 c. serving has 210 calories and 6g of protein, which is filling and GREAT when allowed to sit in vanilla soymilk for a while. Yep, I've been living on a lot of cereal lately. makeup product: Clinique Quick Eyes Cream Shadow -- lured by one of those free-with-purchase deals, I chose this in the green color. This works really well when I'm too lazy to use powders. 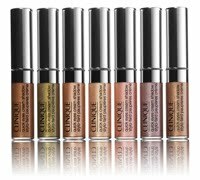 It is shimmery and stays great, even on my eyelids which tend to become oily. It also removes very easily. 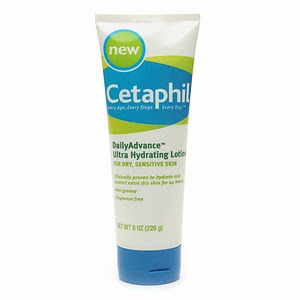 lotion: Cetaphil Daily Advanced -- With the changing weather, my face suddenly decided that it wanted to shed its skin (and lip, agh) even though I lotion up each AM and PM. One of the things that finally stopped it was this lotion. It was a bit on the pricey side (more than $8 at Target), but everytime I put it on, it just feels soooo good, unlike the other lotions I use. It has a very light pleasant scent that really wouldn't bother anyone. My face has become much softer since I started using it. It is amazing.... I'm switching over to this brand as my other lotions run out. 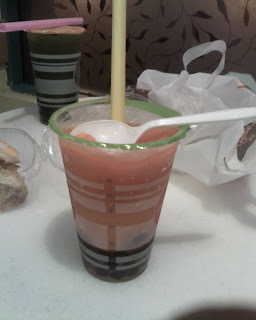 drink: red plum icy slush with boba from Tapioca Express. It tastes like a salted red plum... a little salty, a little sweet, and a little sour -- yummmm. Off to San Diego to take care of some school business! I am excited to be taking some time off next week to celebrate Thanksgiving! I have been incredibly fatigued lately for no real reason. I must be burnt out (again!). Maybe this is just a tapering thing, but I doubt it. I so need a Tapioca Express near me. That slush looked super yummy delicious!